Walt Wagamon was happy to play golf with anyone, and everybody enjoyed playing with him. That’s a very nice way to remember the Cape Region native, who succumbed recently after a yearlong fight with cancer. Ron Barrows, the head golf professional at Rehoboth Beach Country Club, offered that assessment of his friend shortly after Wagamon’s funeral service, held June 26 at the Goshen U.M. Church in Milton, the town where Wagamon was born just over 60 years ago. 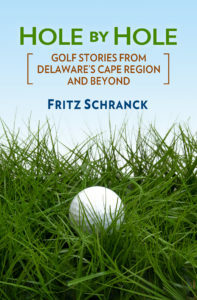 I first met Walt several years ago at Rehoboth Beach CC, his home course. He taught a junior golf clinic that my daughter attended, and I would often see him at the club when I would play there with one or both of my parents. Walt had an affable, easy-going manner about him. Folks just seemed to smile more when he was around. I later came to know Walt as one of the many parents who watched their kids play for Cape Henlopen High School’s golf team over the years. Thanks in part to her dad’s coaching, Christina became one of the standout female golfers for the Vikings during her high school career. Her varsity record helped her earn a four-year golfing scholarship at Catawba College in North Carolina, helped along with a DSGA Scholarship Fund award. Walt and his wife Karen would always keep their distance from Christina as they followed along during her matches. If he saw me approaching, however, Walt would quietly let me know what kind of a game Christina was playing that day. Sometimes it would just be a wink, and other times he’d make some pithy, intelligent comment about her swing. The family knows that Walt had three official holes-in-one, but his brother-in-law, Penn Emerson, told a story about a possible fourth. “It was out on the 19th hole at Rehoboth,” Emerson said. “Walt was just playing around with Christina, I’m not even sure it was a full round. He hit a tee shot, and said he thought it went over the green into the water. Christina and Walt kept looking around, until he stood over the hole and called out, ‘Oh, there it is.’ Christina didn’t know for sure, though, if his ball did go in the water or whether Walt magically found his ball in the hole. Only Walt would know,” Emerson laughed. It appears that Wagamon also enjoyed seeking out and acquiring some outlandish golf memorabilia. Emerson said they once played a round at Bay Hill, Arnold Palmer’s course in Orlando, Florida. Somehow Wagamon managed to buy one of the club’s tractors, complete with the famous Pennzoil logo on it, and then convince Palmer to autograph the tractor. He then brought the autographed tractor back home to Rehoboth Beach. “I never heard him say an unkind word about anybody. He was a wonderful father, and he really enjoyed life,” Emerson said.